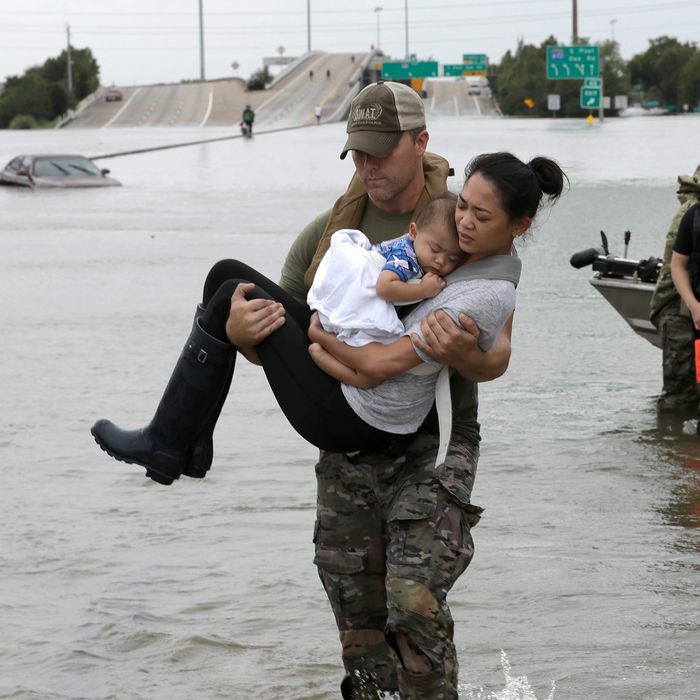 Houston Police officer Daryl Hudeck carries Catherine Pham and her 13-month-old son, Aiden, after rescuing them from their home surrounded by floodwaters on Sunday in Houston. • The Houston area has experienced one of the worst flooding disasters in U.S. history. Tropical Storm Harvey is still hovering over southeast Texas, where it continues to inundate the region. The rainfall has led to catastrophic flooding in Harris County, which includes Houston, and other nearby parts of the state. The Houston metro area is home to some 6.6 million people, and is particularly vulnerable to flooding. Roughly one quarter of Texas residents live in the 18 counties that have now been declared federal disaster areas. • The rainfall totals over the past 72 hours are astounding. Harris County has recorded more than 32 inches of rainfall; Galveston County has registered just shy of three feet, at 34 inches. • Much of southeast Texas saw waves of torrential rainfall over the weekend. Near-continuous flash-flood emergency warnings have been issued for many areas, and most residents have been urged to shelter in place and avoid driving; major highways and streets are underwater. Tornado warnings have also been repeatedly issued throughout the day. • Harvey’s death toll has risen to ten, at least six of them in Harris County. At least a dozen have been injured as a result of the storm, which crashed into Texas as a Category 4 hurricane on Friday night before weakening. 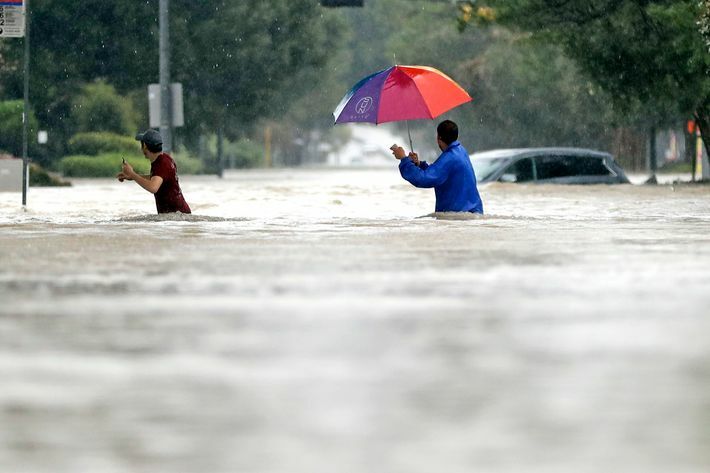 • Harris County authorities performed thousands of high-water rescues as residents became trapped in stalled cars or their homes, after deep floodwaters rose. Texas’s entire National Guard — about 12,000 members — has been activated. The U.S. Coast Guard and local boat owners have also been performing rescues. More than 250 Texas highways have been closed, and well over 300,000 have lost power. 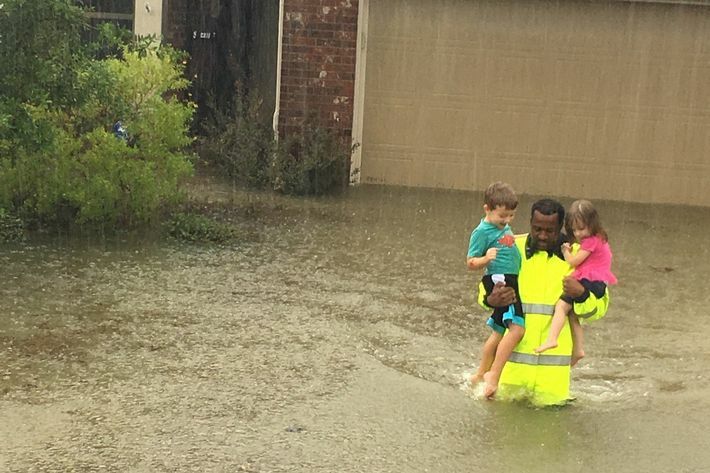 The city of Houston had received more than 50,000 911 calls by Sunday afternoon. • The White House announced on Sunday afternoon that President Trump is planning to visit to south Texas, near where Harvey made landfall on Friday. • On Monday morning, President Trump issued a federal disaster declaration for six parishes in Louisiana in the path of Tropical Storm Harvey. The National Hurricane Service’s five-day forecast for Harvey, as of 5 a.m. Monday. The forecast is still not good. Harvey has dumped more than 11 trillion of gallons of rain on Texas so far. Downpours pummeled southeast Texas and southwest Louisiana overnight Sunday. Flash-flood warnings remained in effect for much of southeastern Texas, and part of Texas and Louisiana are under a tornado watch as well. Our top models have become a bit more consistent on Harvey’s short-term future. The storm’s center is now expected to move slightly offshore by Monday, still as a tropical storm, then return onshore by Wednesday on a northward track expected to be near or perhaps just west of Houston. As a result, a new Tropical Storm Warning has been issued from Port O’Connor to Sargent, TX, with a Tropical Storm Watch extending north of Sargent to San Luis Pass, at the southwest end of Galveston Island. None of this motion will be rapid, and Harvey’s location by Wednesday may be less than 100 miles from its current position. Harvey could pick up slightly in intensity while offshore, but nearly half of its circulation has remained over water thus far, so a modest offshore motion will probably only lead to a slight boost in winds, if that. Harvey should pick up speed as it heads north on Wednesday, and conditions are likely to begin improving at last over southeast Texas. 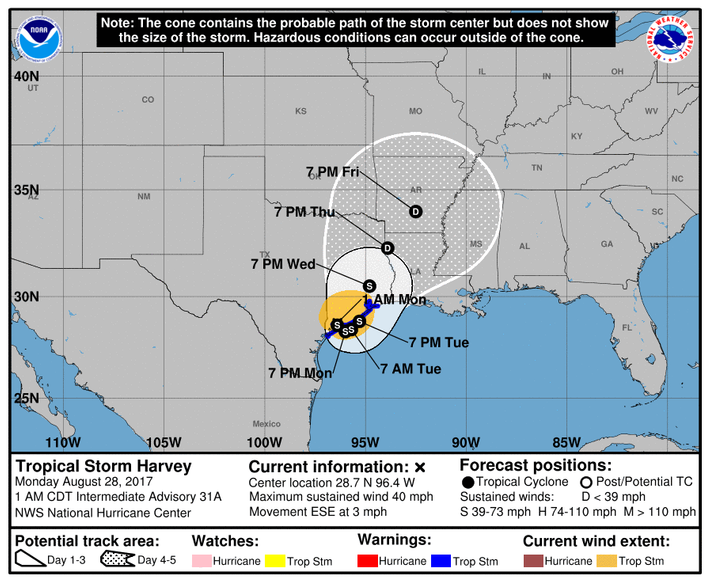 Tropical Storm Harvey “is expected to be just offshore of the middle and upper coasts of Texas through tonight, then move inland over the northwestern Gulf coast on Wednesday,” according to the National Weather Service. Hopefully, this will allow some of the floodwaters to drain away in Houston, and if we’re really lucky there will be a break between the bands of additional rainfall that are currently projected to arrive on Tuesday and Wednesday in eastern Texas and southwestern Louisiana. Either way, there’s more trouble in store. The National Weather Service predicts that the upper Texas coast and southwestern Louisiana will receive another 15 to 25 inches through Friday. The 72-hour rainfall totals in parts of Texas are close to record-shattering. Harris County notched more than 32 inches in some spots; Galveston County crept past 34 inches. Liberty County, northeast of Houston got blasted with more than 39 inches of rain. Some areas may get as much as 50 inches of rain by the time Harvey lets up. As a point of reference, that’s more rain than Houston typically receives in an entire year. The storm’s total rainfall may very well set an all-time U.S. record. The convention center has the capacity to fit approximately 4,000 people, and hundreds more are expected to arrive in the coming days. Thousands of other displaced people are scattered at other shelters across the region. Officials in Dallas plan to use the city’s Kay Bailey Hutchinson Convention Center as a “mega shelter,” opening its doors to 5,000 evacuees on Tuesday morning. It's not a typical Sunday. Mayor Turner defended his decision not to evacuate the city, claiming that such a move would have caused even more chaos. Texas governor Greg Abbott had advised Houston residents to leave on Friday, contradicting the mayor. Turner’s decision will undoubtedly be criticized in the days to come, particularly if the flooding results in a high death toll, but he also wasn’t wrong to be concerned about the dangers of sudden mass evacuation. In 2005, following the devastation of Hurricane Katrina in New Orleans, dozens of Texans died as a result of accidents and heat-related illnesses during a chaotic gridlocked evacuation in which 3 million people attempted to leave south and southeast Texas in order to escape the path of Hurricane Rita. The evacuation ultimately killed about as many people as the storm itself did. Governor Abbott has designated 54 Texas counties as state disaster areas, including 18 that are designated federal disaster areas. Abbott activated 3,000 Texas National and State Guard members to help deal with the crisis, and said Monday he would deploy the entire Texas National Guard, bringing the force up to 12,000. The U.S. Coast Guard said on Sunday that they had already rescued at least 100 people from the air by midday. Early on Monday morning, crews were forced to begin releasing water from two flood-control reservoirs in the Houston area ahead of schedule. The dams were built in the ’40s to protect downtown Houston from catastrophic flooding, and the U.S. Army Corps of Engineers said it needs to take some pressure off the dams. Voluntary evacuation orders were issued for those who live near the reservoirs. Officials called for a mandatory evacuation of Dickinson on Monday — one of a few mandatory and voluntary orders for the towns between Houston and Galveston. Both major Houston airports are closed until further notice, and there was one report that some 500 people were stranded at Hobby Airport thanks to the flood. Houston’s main public hospital, Ben Taub, began trying to evacuate its patients on Sunday after it experienced first-floor flooding. Critical patients were to be relocated first, but the evacuation efforts were put on hold because the hospital was surrounded by waist-deep water. The hospital’s power generator was not affected by the flooding, but its kitchen had to be closed, limiting the facility’s food supply. The evacuation will proceed once floodwaters around the building recede, but that could take days. Volunteers from out of state are heeding local governments’ calls. Members of Louisiana’s grassroots Cajun Navy have been assisting with recovery operations. Late on Monday one member of the group, Clyde Cain, told CNN that people were becoming desperate, and some even shot at rescuers for failing to stop. FEMA director Brock Long, speaking to CNN’s Jake Tapper, said that his agency was preparing for the long haul of recovery work. Asked whether the agency would be in Texas for months, Long responded, “FEMA’s gonna be there for years, sir.” He maintained that the agency had learned from its response to Hurricane Katrina, and assured Tapper that he was not concerned about the vacancies left by the Trump administration in key posts at the National Hurricane Center and the National Oceanic and Atmospheric Administration. Right now, federal assistance is mostly going to the search-and-rescue operation; clean-up has not even begun. Long said Monday that FEMA is shipping 2 million meals and 2 million liters of water to the region, and he expects more than 450,000 people to seek federal assistance as a result of the flooding damage in and around Houston. Everything that we had hoped wouldn’t happen but was forecasted is happening. We have a catastrophic, life-threatening flood event taking place over southeastern Texas, including the Houston metropolitan area. It’s bad now and it’s getting worse. The White House said that the president will travel to Texas on Tuesday, and it claimed that Trump has done nothing but follow the storm from Camp David over the weekend. Ahead of his visit, Trump said Monday afternoon that he pledged “100 percent” to those affected by the storm, and said he might visit the state again — as well as Louisiana — at the end of the week. Governor Abbott said Trump will not visit Houston as the disaster will still be unfolding in real-time there, but will visit the area where the Category 4 storm first hit land, and where clean-up efforts are already under way. The White House announced Monday that Trump had approved a disaster declaration for six parishes in Louisiana, which is also at risk of significant flooding. Trump also went on a retweeting binge on Monday, which included a picture of a Texas National Guard rescue mission; other tweets addressed the political controversies du jour, including his hasty pardon of divisive former Maricopa County sheriff Joe Arpaio. On Sunday morning, Trump interspersed tweets about the flooding with his thoughts on other matters, like Sheriff David Clarke’s new book and the president’s margin of victory in Missouri last year. None of Trump’s tweets through early Sunday evening seemed to express much empathy for people caught in the crisis. Instead, he seemed most interested in talking about how big the storm was and promoting the competence of the government response. 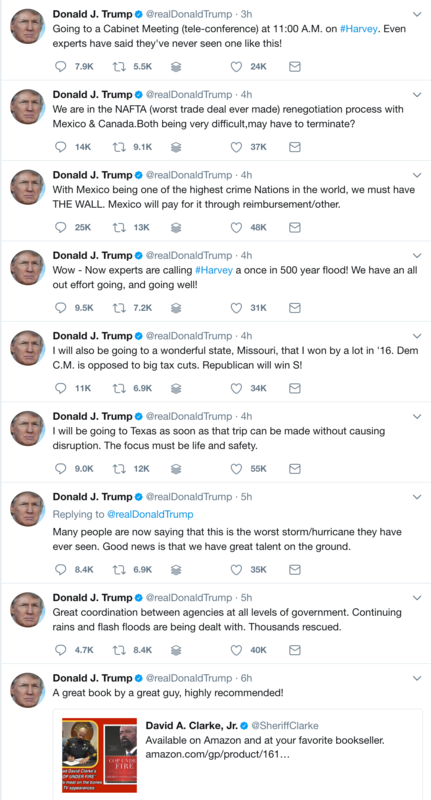 Harvey’s death toll has reached ten. There are also reports that a family of six, including three children and two grandparents, drowned while trying to escape the floodwaters in Houston. Governor Abbott called Harvey “one of the largest disasters America has ever faced,” and warned against expecting a speedy recovery. “We need to recognize it will be a new normal, a new and different normal for this entire region,” he said.